First, you need three ingredients: All purpose flour, semolina, and egg yolk. Yes, you can make fresh pasta dough with variations on these ingredients but I have found these to be the best. The semolina gives the dough tructure and the use of just egg yolks gives it rich taste and golden hew. Next you want mix the flour and semolina. Then slowly add the egg yolk. You want to end up with a dough that is coming together but is not too moist or sicky. This will make it impossible to work with. Your dough should look like something below and should take you about 10 minutes. Once you've got your dough, let it rest for another 10 minutes. In that time get some heating water on the stove top for eventually cooking it. You can also gather any ingredients you might need for a sauce. Simple is usually best. Try olive oil, tomatoes, parsley, scallions, and cheese. Now, once the dough has rested it's time to start rolling out the dough into sheets of pasta. This is going to be the hardest part if you've never done this before. But it's ok, don't be afraid and just take charge. You first want to shape it so that it will fit through your pasta rolling machine on setting 0. This is the widest setting and will make your dough come out like the photo below. Go through 0 a few times until you get the hang of it and it starts forming into a recognizable sheet of pasta. Eventually work all the way to setting 7 where the sheets are thin enough for farfalle. Along the way you should cut the sheet into smaller sheets that you find manageable to work. It should take you about 15 minutes to get to setting 7. This is setting 7. Once you're going to want to lay your sheets on a surface with rice flour. This prevents the sheets from sticking to the surface. Now we get to shape and cut our dough into farfalle. You want to cut the sheets of pasta into rectangles. They can be as little or as big as you want them to be. Take one pasta rectangle and place your index (first) finger in the centre. Use your thumb and second finger to pull the top and bottom edges together, then slip your index finger away at the last second and squidge these edges together so that they stick. For a 1/2 pound of pasta this will take about 15 min. 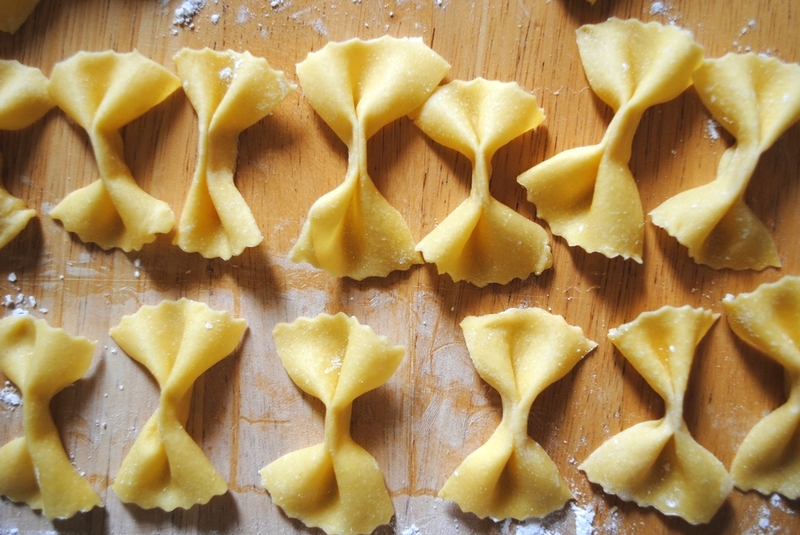 Now all you have to do is cook the farfalle. Throw them in batches into your salted pot of water and cook for about 1 minute. When they're all ready serve them with your sauce and you're ready. Fresh farfalle in under an hour. You did it!